As I write this in London, the Kermadecs – the chain of volcanic islands in the Pacific where Mr Peacock’s Possessions is set – feel further away than ever. Here’s a photograph of me back in March saying a sad farewell to Raoul, reimagined in my book as Monday Island. I’d come within feet of its landing rock in a NZ Navy speedboat, flown over the island in a helicopter, and spent day after day on deck gazing at the place, but I never actually set foot on land or smelled the soil as I’d hoped. And here’s what I wrote from on board HMNZS Canterbury about the experience of waiting and wondering during an extraordinary expedition to one of the most remote and untouched places on the planet. (Every time Commander Matt Wray goes, he fills in more of the dotted lines on the map – we were literally travelling in uncharted waters.) I went with the Sir Peter Blake Trust, joining a crew of scientists, young environmentalists, and educators, including artist and former Raoul volunteer, Giselle Clark. If you’d like to find out more about what took me to the Kermadecs and how the journey enriched my understanding of the place, its complex history and also its future, do listen to this in-depth interview for Radio New Zealand with leading broadcaster Kim Hill. 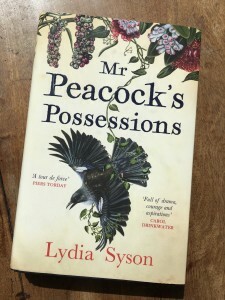 I’m delighted to say that she loved Mr Peacock’s Possessions and her questions were wide-ranging: among other things we talked about historical fiction for adults and younger readers, the extraordinary history of the Bell family, conservation and the environment and why the proposed Kermadecs Ocean Sanctuary promises to be so important to our understanding of the world’s oceans. Oh, and also possession, migration, faith….and the volcanic island theory of literature. You can stroke it, see it and buy it in bookshops from May 17th – and pre-order it any time before that. If you’d like a signed and dedicated copy from one of my local bookshops, please let them (and me) know and I’ll do what I can. (It’s no cheaper or faster on Amazon, I’m glad to say – only £12.99 everywhere.) Or reserve it at your library, if you are lucky enough still to have one. A new exhibition which has just opened at the British Library, James Cook: The Voyages, couldn’t be more timely and I do recommend a visit. As you walk in you are greeted by This Splendid Land by John Pule, born in Niue and one of the most accomplished artists in the Pacific. You can also see William Hodges’ 1774 view of Niue, which Cook named ‘Savage Island’ after he had failed to make contact with its inhabitants. The globe below shows a section of Cook’s second voyage route and gives a good sense of how far all the characters in Mr Peacock’s Possessions had to voyage themselves, and also how close Cook came to the Kermadecs, which were first sighted by Europeans from a scurvy-ridden convict ship in 1788: its crew included a Lieutenant Watts and a steward who had served on board the Resolution under Cook. The islands were first charted in 1793 by a French explorer, Bruni d’Entrecasteaux. 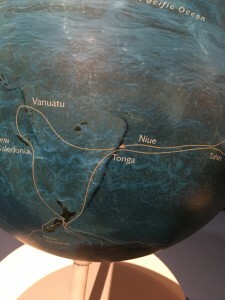 The Māori call them Rangitāhua, and Polynesians visited them from the 1300s.